Kahu – Rev. 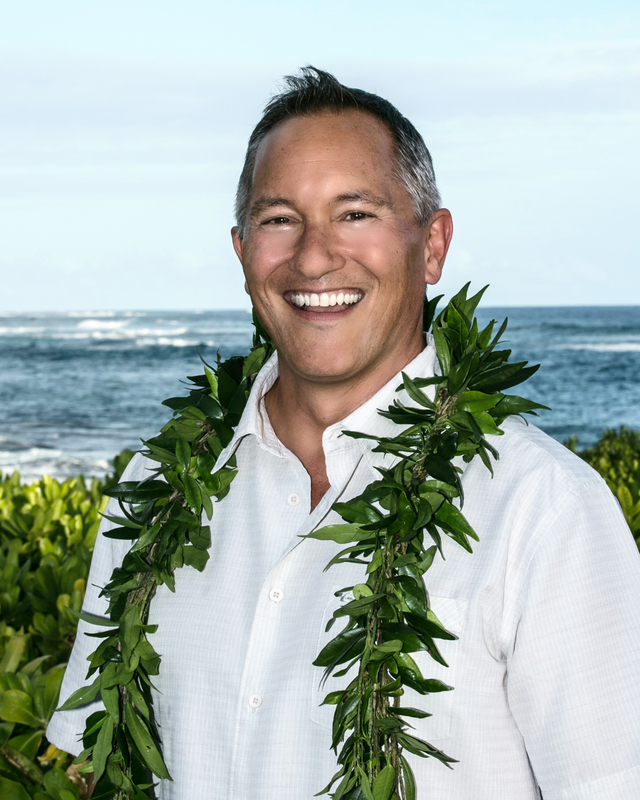 Dr. Alan Akana has been our Kahu (Pastor) since February 2014. He was born and raised on the San Francisco Peninsula where his family settled from the Island of Hawaii in the late 1950’s. Dr. Akana is an ordained minister in the United Church of Christ. A graduate of Palo Alto High School, he received his Masters of Divinity (1990) and Doctor of Ministry (1999) degrees from Fuller Theological Seminary in Pasadena, CA. He has spent 26 years in parish ministry in Hawaii, Montana, Utah, Texas, and California. Dr. Akana also spent 6 years working full-time as a consultant to faith-based organizations, leading feasibility studies and capital fund campaigns. He is also an accomplished artist and published author, and enjoys writing, reading, water coloring, and spending time outdoors. Koloa Union Church hosts a gallery featuring the works of Kahu (Pastor) Alan Akana. The gallery is just around the corner from the church at 3281 Waikomo Road in the historic Smith Memorial Parsonage, a beautiful building on the grounds formerly owned by Congregationalist missionaries. Proceeds from sales at the gallery support the maintenance, upgrades and repairs of the parsonage. 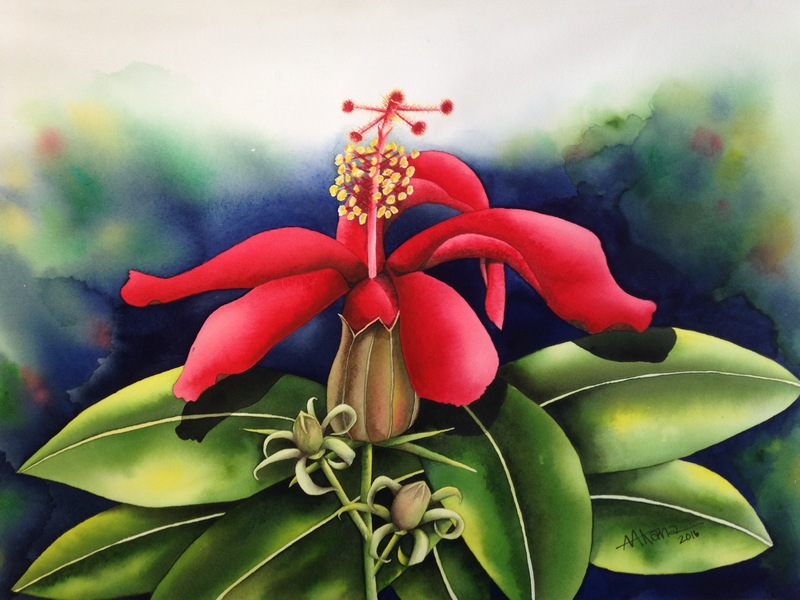 Dr. Akana has been watercoloring the flowers of Hawaii since 1993 and features his work of nearly a quarter of a century. Gallery hours are 1 to 5 p.m. Sunday through Thursday. See www.alanakanagallery.com to learn more about the gallery and Dr. Akana’s art. The revised edition of Dr. Akana’s book is now available: The Volcano Is Our Home: Nine Generations of a Hawaiian Family on Kilauea Volcano (Bloomington: Balboa Press, 2016). Signed copies are available at Koloa Union Church and at Alan Akana Gallery. A portion of the proceeds from sales go to a fund to improve and maintain the church’s buildings and grounds. For more information, visit www.thevolcanoisourhome.com. Administrative Assistant – Penny Osuga is a 3rd generation member of Kōloa Union Church, following in the footsteps of her parents and grandparents. 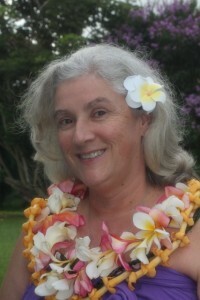 She enjoys flower gardening and spending time with her grandchildren. Penny has been our Administrative Assistant since 2007. She is in the office from 8-noon Monday through Thursday. Director of Music – Kathleen Dahill has a B.S. in theater education and a wealth of experience writing and arranging music, as well as accompanying and leading musical groups. She has won several musical awards, including a Mokihana Award for best new Hawaiian song. Kathleen is available during the week by appointment.